Don't I clean up nice? Well, not me, my closet. 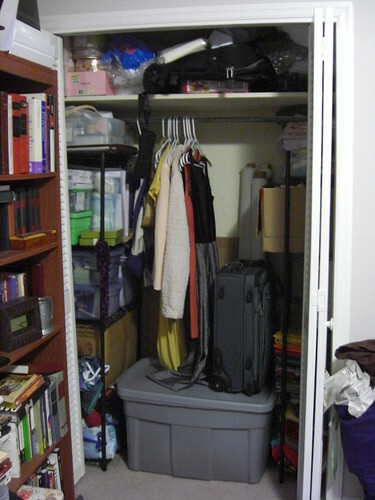 Having the luxury of a closet just for my crafty pursuits (thanks honey! 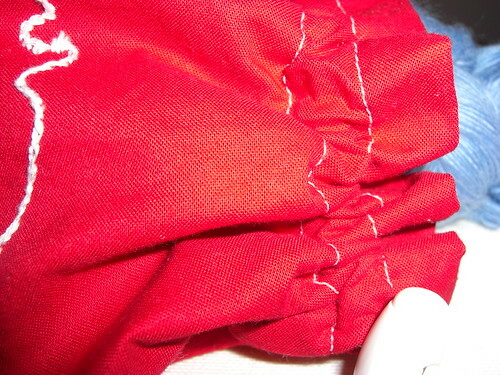 ), means I'm sometimes overzealous about what I'll buy or keep for scraps/refashioning/repair. 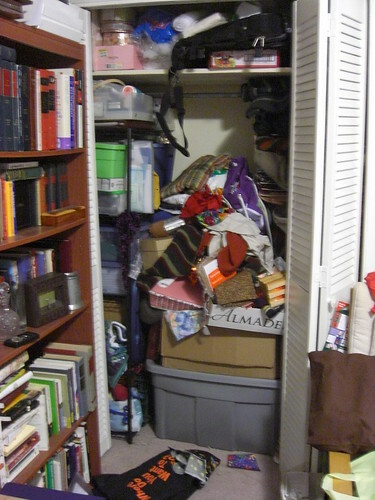 Add to that occasionally wanting someone else to be able to use the room (it is, theoretically, a guest room, craft room, and office all in one), and I end up with a heap of stuff piled precariously in the closet, like those parodies of closets you see in cartoons. This weekend, seeing as I did not forsee anyone else suddenly needing to use the room, I unloaded the closet, assembled some new shelves (a story in itself, really), and re-loaded. Phew! I haven't quite done the major purge that needs to be done, but at least I can do that in an organized fashion, without fear of things falling on my head. And one of the coolest things? 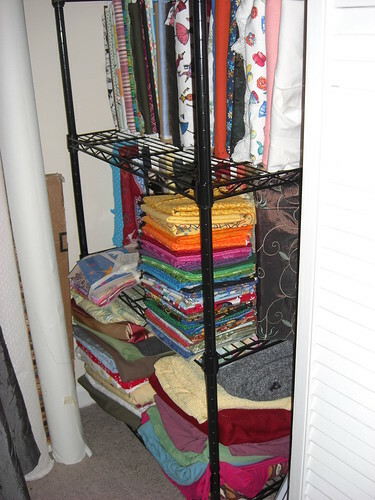 It's like my very own fabric store! (a la splityarn). On Christmas Eve, there was quite a discussion about favorite colors. My father-in-law maintains that the whole concept is silly. What does favorite color mean? Just because your favorite color is yellow doesn't mean you think the world would be better if everything were yellow, does it? I think when I was younger, I said my favorite color was blue. 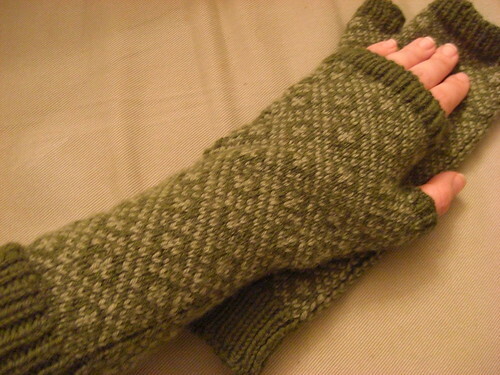 But now I've maintained for several years now that I don't have any favorite colors--I pretty much like them all. But I think when I was younger that always seemed like a cop-out. It is, but it's true. Which is why I laughed the other day when I looked down into my purse. What can I say? What about you? Do you have a favorite color? Do you think you would have a favorite color if your aunt/kindergarten teacher/elderly neighbor hadn't asked you which one was your favorite? Is it your favorite color to wear? Favorite color to look at? 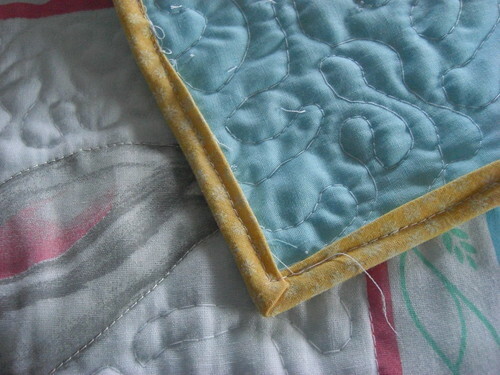 Several years ago, I decided I wanted to try quilting. So Mom presented me with a panel and I set out on my merry way. 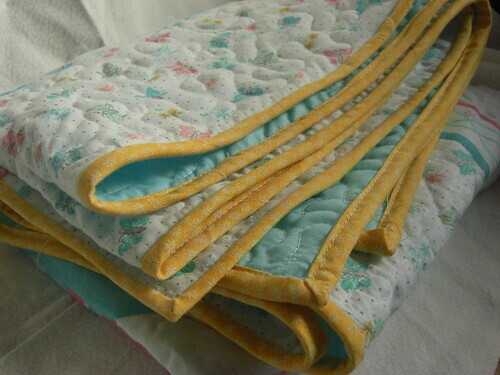 I quilted for a bit, and then, as happens with my projects sometimes (a lot of times), it got put aside for other things. Oh well. This one was still first. 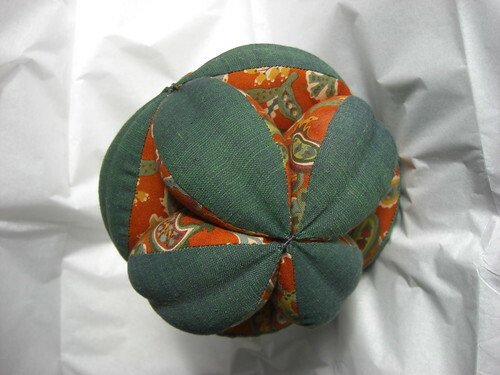 I picked it back up before Christmas, put it down again to do Christmas crafting, and just clipped the last threads from the binding (Pictures were taken pre-thread-clipping. Sorry about that). It was my first bias binding. Also, the first time I attached binding by machine. 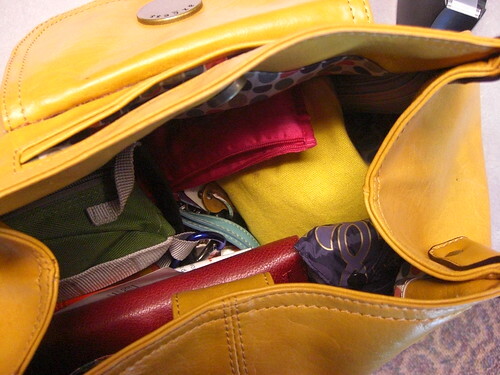 The wonkiness of the binding is not my favorite, but I love the bias-ness, and the yellow! I think it adds a nice touch. And as Mom points out, it's probably sturdier when machine sewn than it would have been with my standard slip-stitching job. It was also my first time doing any sort of free motion quilting. Which I think is fun. 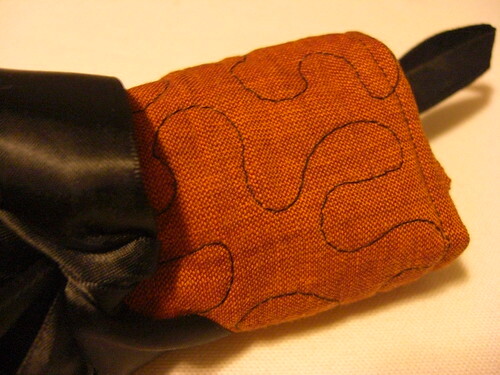 I think I'm going to have to make a bunch of quilted pouches and stuff to practice, though. It's been folded up and put away for the next time I see my parents. 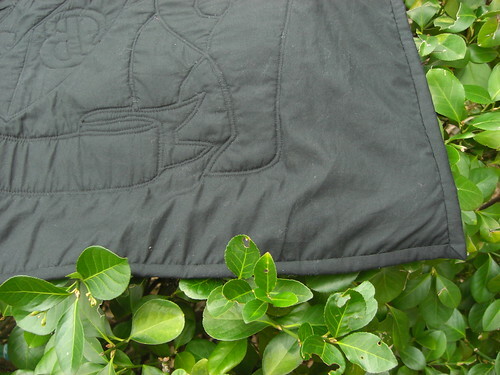 Either my mom or my grandma will get it to some sort of charity providing quilts for kids. I hope they like it! Since most of my crafty efforts in the last few days have gone to thinking of creative ways of getting a pile of new clothes from my mother-in-law to fit into my drawers, or researching other people's solutions for removing soap scum, I don't have a whole lot to show for myself (but my clothes are put away, and my tub is clean, and that's no small feat for me). Full disclosure: I started these before I graduated from college (Spring 2007), and just finished in fall of 08. But that's not really because it was so hard, or took that long. Just that I'm totally a project hopper. Being the oldest cousin and part of a relatively small family means that in my family, the wee little ones are scarce. As a matter of fact, for a while, I thought my youngest relative would be only three years younger than myself. Which doesn't leave a whole lot of room for all the awesome toy patterns I've found on the internet in the past couple of years. But then I got married, and lo and behold, there were kids! Young kids! 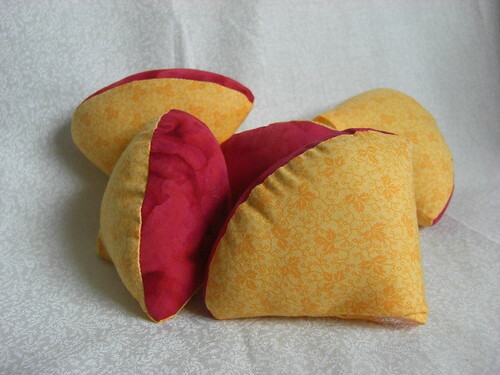 Kids who will henceforth have my handicrafts thrust upon them! Alas, there is only one girl. So even if I feel like a pretty progressive, cool gift-giver, you can bet she'll probably get some presents that I just don't feel right about giving to the boys. Enter Hilary Lang, of Wee Wonderfuls. 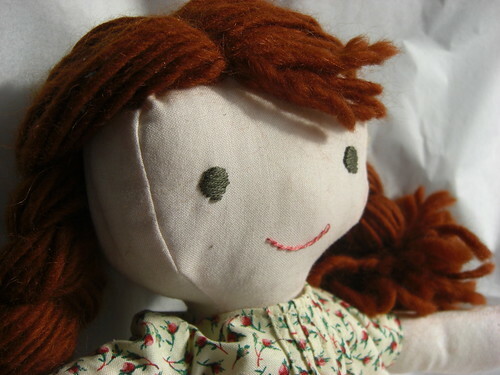 Her site is full of the most adorable toys and embroidery. I waited with bated breath for the release of her Kit, Chloe, and Louise pattern. Three dolls+clothes+shoes+adorable pictures=awesome. I embroidered her eyes rather than going out and getting some wool felt. She's pretty pale, so all the fuzz from her hair shows up on her skin, as you can see in the picture, but I still think she's pretty adorable. 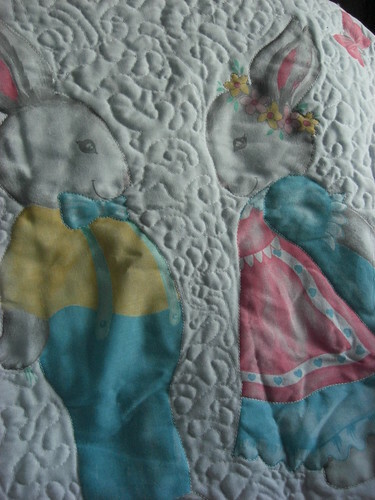 I also had the best of intentions about making a whole wardrobe, a doll quilt, all kinds of stuff to go with her. But I didn't. She doesn't even have any shoes. But as my sister could tell you, "We're from Tennessee. We don't wear shoes." At least she's not naked. She stole Chloe's dress though (the nerve!). In the past month, I've made two of these little toys (and now I kind of want one for myself, so we'll see if a third is on the horizon). I saw a picture in Last Minute Patchwork and Quilted Gifts while browsing in the bookstore. (As a total aside, it's really nice working in a building with a Border's downstairs). 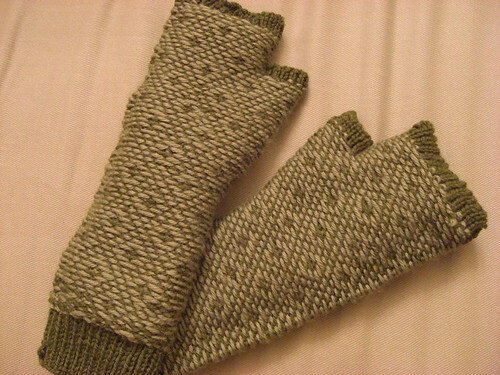 Then I saw pictures of some other versions on Craftster and Etsy. First I made and stuffed a bunch of pieces. I called them "wedgies," which I think might have weirded my husband's family out when I asked them to help me. Unfortunately, I am not on top of things enough to have a picture of one ball all the way through, so you'll have to take the color-changing as a bit of magic. The red fabric is a batik also used for some matching burp cloths, and the orange paisley is a fat quarter I purchased at the quilt show with my family.